Boy, did you piss me off today. So while you weren’t looking, i took a piece of your hair/clothing/belonging, went home and i am now sticking pins in it. You, of course, are having sudden unexplained pains in certain areas of your body. 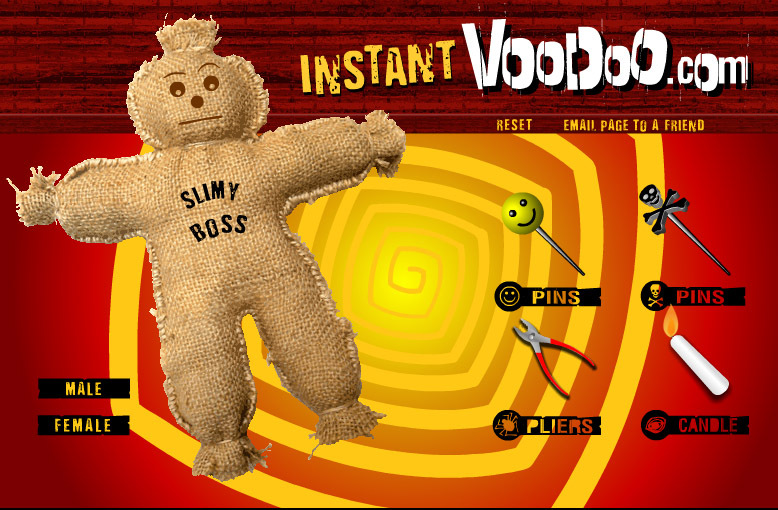 This is the popular image of Voodoo Dolls. However, the use of such dolls not only for Voudon, but also across multiple cultures and history is much more varied. They are also used for healing, protection, love spells and spiritual guidance.The dolls are used as messengers to the spirit world. To accomplish this they are nailed to a tree in a graveyard with a message to the world beyond. .
As with any form of Magick, the assumption is always that symbolic actions performed with intent can have an effect in wider or spiritual realms and cause changes beyond the simple act itself. Thus the doll is not just a doll. They are made to have an empowerment potential which is activated when a piece of cloth, hair, rope, tack, etc is attached to it which can effect people or events. So where so these dolls come from? Voodoo dolls as we know them today are actually the combination of two sources: the Western African practice of Bocio and the european Poppet. It is from the European Poppet that we get the pin sticking stereotype. The european Poppet uses what is called ‘sympathetic magic’. Whatever happens to the doll happens in the real world. Hence the pin sticking. European folk magic has used the poppet since before Europe, actually. It traces back to Egypt. In 1100 BCE, the many enemies of Pharaoh Ramses III of Egypt (which included the women of his harem and a treasury official) used wax images of him to bring about his death. They made their way into folk magic in europe. From there they branched off. Much like Tarot branches into both an esoteric art and playing cards, poppets exist as not only folk magic, but children’s dolls and then theater as they evolved into the modern day puppet. I would note that puppets as theatrical devices trace back to 1000BC in India and China. Never the less, the word puppet comes from poppet and the two traditions evolve and intersect in tangent with one another. The influence of the European poppet on the Voodoo doll is greater than people realize, who assume it is purely an African invention popularized by slaves brought to the New World. The slaves did bring their own version which differs in some subtle but profound ways: bocio. The slaves torn from Africa brought with them their own fetishes (and by fetish, i of course mean the traditional defintion of “the attribution of religious or mystical qualities to inanimate objects”) Bocio. 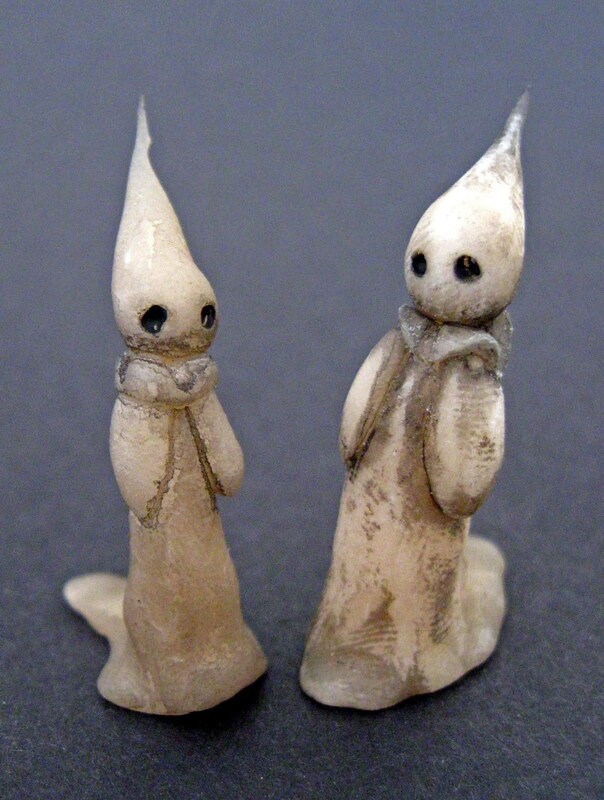 Bocio were designed more as objects that take on animation and become mediators to the spirit world. They could communicate with ancestors, gods and if necessary, through that intereaction the ancestors or dieties could bring some type of help, supplication or protection to the doll’s sender, influencing events both positively and negatively. The point of difference is that traditionally, the doll itself is not the power nor does it represent a real person. It is merely a messenger to those with the power to affect change. Eventually the doll did came to be able to store, harness and direct the owner’s own spiritual power therebye containing spiritual powers, although it still did not represent another human being. Sacred materials like claws, feathers and animal skulls are bound to the surface of a wooden figure with cord or cloth, then encrusted with clay, palm oil or sacrificial blood. The bocio are very striking, very intense and are supposed to be that way. When the slaves arrived the marriage between european traditions and african traditions resulted, the combinations of which have sparked some of the greatest creative artistic explosions in history. (we could talk only about music for days). The poppet and bocio merged in varying degrees and became the Voodoo Doll that we think of today.. There are of course a myriad of Voodoun traditions, from Louisiana to Haitian, who practice their own variations when using Voudon dolls. Aditionally, Poppets themselves have also evolved and enjoyed a resurgence in modern evolutions of European magic, with Wicca being the most well known. Reblogged this on Wiccan Witchcraft.